It all started when I spied the prettiest baby bok choy in the produce department. It was so vibrant and crunchy and just called out for a dish to be prepared in dedication to its delectable-ness. Well okay then, a stir fry seemed in order. I grabbed some pork, fixin’s for a sauce, and some other pretty produce and set about to make a meal. When I spoke to Charles about his thoughts for a wine to drink, he wanted to try a Barbera. An Italian varietal with an Asian meal might seem to be a rather bold choice, but the best part of wine pairing is the experimentation. The worst that can happen is that the pairing doesn’t work. The world won’t end. You won’t descend down a shame spiral. Have some water with the meal and save the wine to enjoy as a digestif while binge watching whatever current TV obsession you may be in the midst of. We learn from our choices. Sometimes they pay off. Sometimes they’re rather awful, but they’re always an adventure. How did that bold Barbera option go with dinner? It may not have been a transcendent experience, but it actually paired pretty well. 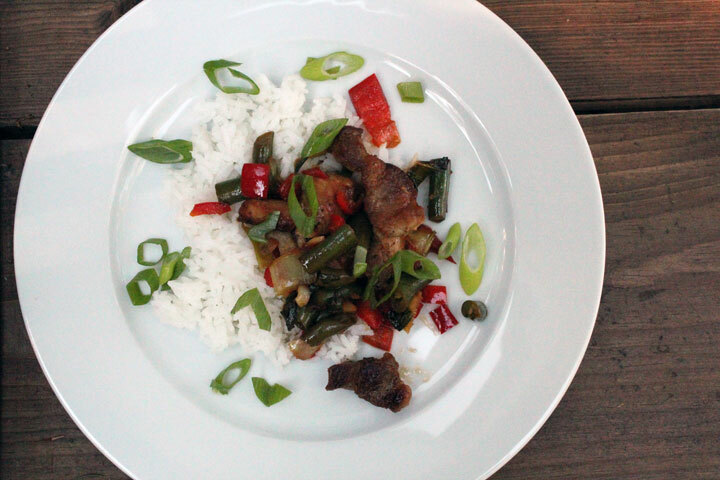 The wine complimented the pork, and nuances of flavor were brought out by the ginger and sweet chili sauce. The Barbera didn’t play along with the green beans in the dish, but all in all, I’d try it again. I might just tweak the recipe a tad — less vinegar, no beans, a little more soy sauce — in order to allow the wine to sing a bit more. My fall back wine that goes with everything, the Gazela Vinho Verde Rosé, would have worked with dinner, too. As would an amber ale. Don’t be afraid to try new things. It makes a meal more exciting. Heat a stove-top wok or deep sauté pan over high heat.Toss pork with sesame oil, salt, and pepper and put in pan. Let sit for two minutes. Flip pieces and let sit another two minutes. Stir to make sure everything is cooked and crispy. Remove from pan and set aside. Place pan back over high heat. Add oil. Toss in bok choy and stir fry for two minutes then add green beans, garlic, and bell pepper and stir for an additional three minutes. Turn heat down to the lowest setting. Add vinegar, soy sauce, sugar, and chili sauce to a mason jar. Screw on the lid and shake until everything is completely mixed. Stir in the sauce and toss until the sauce is warmed. Sprinkle the green onions on top and serve with rice.